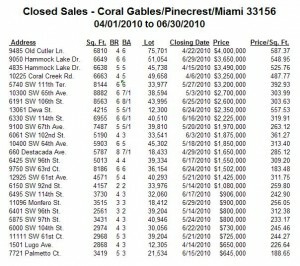 The table below reports closed sales of single-family homes in zip code 33156, encompassing parts of Miami, Pinecrest and Coral Gables, FL. Recently closed sales are the principal guide to current property values in a local real estate market. 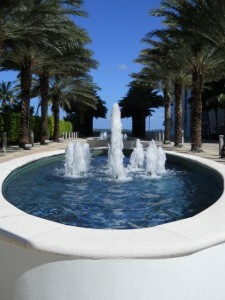 Because The Real Estate Fountain focuses on mid-range to luxury properties, the table may exclude sales of smaller homes on smaller lots, or outside the usual areas of interest. Data are from tax records, and thus are not limited to MLS transactions. The months’ supply of homes for sale is one the real estate market’s vital signs. 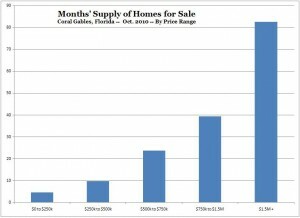 A previous post explained this indicator and noted that Coral Gables had been in relatively stable condition, with about a 14-month supply of homes for sale. That was quite a bit higher than the 6-8 months in a normal market, but way down from the 40 to 50 months’ supply seen during the height of the credit crisis. The number deteriorated in September to 23.7. That’s very high. Stability has given way to instability. Another previous post noted that the luxury real estate market in Coral Gables was stuck in the muck, with a 30-month supply of homes over $1.5 million, well over the 10-12 months’ worth that is normal at the high end. And now? 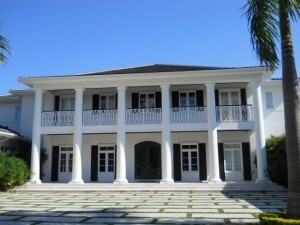 Based on September sales, there is an 82.5-month supply of homes for sale in the real estate market in Coral Gables. Granted, September is not high season for closings, but this is dreadful. Sellers of high-end homes in Coral Gables need to wake from their dreams and lower their prices. Meanwhile, at the low end, the months’ supply figures are normal, even robust. Segmenting the market by price range shows just how healthy the low end is, and just how sick the high end is. 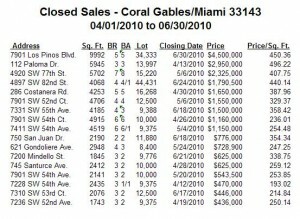 The table below reports closed sales of single-family homes in zip code 33143, Miami and Coral Gables, FL, for the second quarter of 2010 (April 1 to June 30). Recently closed sales are the principal guide to current property values in a local real estate market. 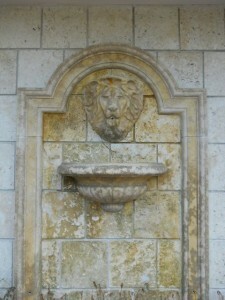 Photo of fountain at Jade Condominium, 1331 Brickell Bay Drive in the Brickell neighborhood of downtown Miami. 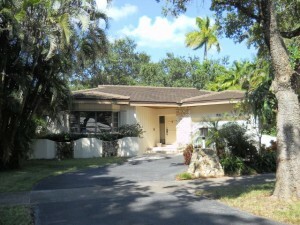 The house at 1234 Alhambra Circle recently sold for $935,000. The advertised listing price was nearly $1.2 million. 1234 Alhambra is a 4-bed, 3-bath, 3765-sf house on a fairly small lot, built in 2000, with a 2-car garage and a pool. 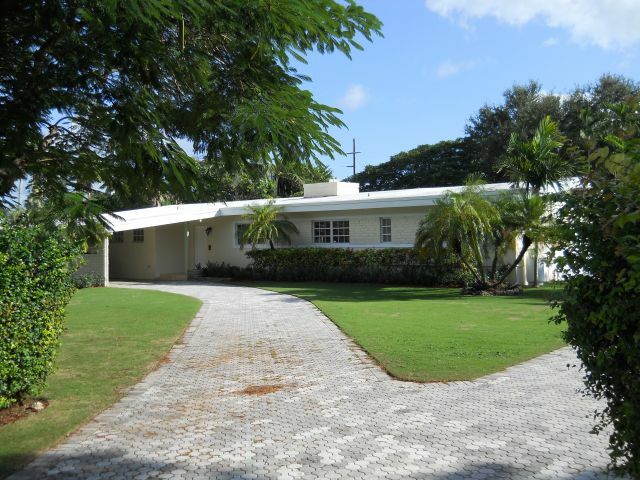 The sale price works to $248/sf, pretty good for a nearly new house in a nice Coral Gables neighborhood. Several gauges of the homebuilding industry released this week indicate slow progress at best — which is a whole lot better than some of the alternatives. 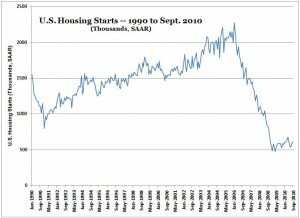 Housing starts rose a very tepid 0.3% last month, following a strong 10%+ jump the month before. But that’s o.k. 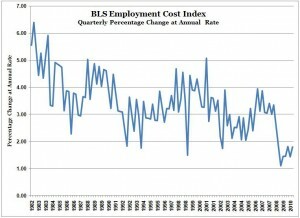 ; the numbers are still tracing out a mild upward trajectory from the low in early 2009. The National Association of Homebuilders released its Housing Market Index, a measure of sentiment in the industry. The index rebounded to 16 from a dangerously low 13. Prior posts here commented on the 14 to 15 area as a critical support level. The cycle low was in the single digits. It seems the support may have held. Time will tell. Homebuilder stocks are well off their lows in early 2009, but have lost the lustre they had during the government-handout days. The HGX index has broken its uptrend and is clearly in a sideways trading range. 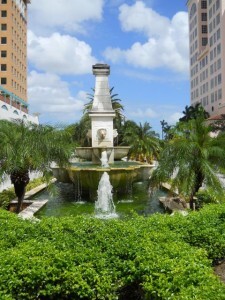 What does all this have to do with real estate in Miami and Coral Gables? Do local home values really correlate with these nationwide measures of the housing industry? 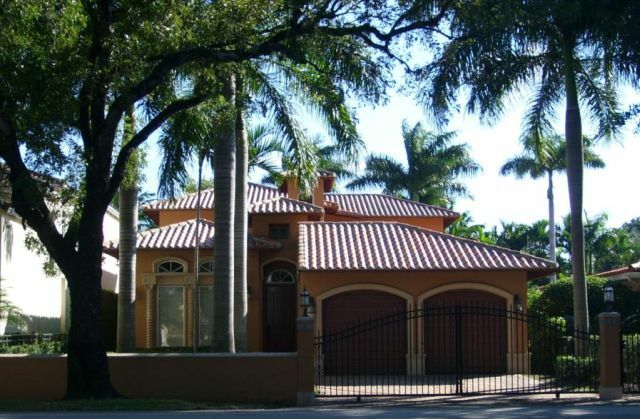 No guarantees, but property sales and values in Miami and Coral Gables rose in tandem with these national measures, and rolled over and crashed with them too. Maybe the local market will decouple from the national experience, but there’s no clear evidence of that yet. The previous post reported the current outlook of hedge fund manager Kyle Bass, who made a fortune off the recent collapse of the financial-realty complex. Essentially, Bass sees hyperinflation in America’s future, like what happened in Zimbabwe. At the same time, Bass sees median real estate prices staying flat at best for several more years, and high-end real estate prices heading lower. Anyone see a contradiction in that? Would real estate sputter along if hyperinflation took hold? Hardly. Real estate is a classic inflation hedge. Property prices will skyrocket if hyperinflation develops, just like in Zimbabwe, where property prices increased at an annual rate of 5,000% during that country’s hyperinflation. About the only thing confirming the hyperinflation thesis is the price of gold and other precious metals. But that could well be a fad that will end in tears just like every other bubble that sucked in money from the weakest among us before popping. The gold-bug advertising littering all media right now could signal that the end is near. The last time gold shot to the moon (in 1979-80), inflation was already soaring into the double-digits, eventually exceeding 14% year over year. Are we experiencing anything like that now? Likewise, the last time gold shot to the moon, wages were leaping ahead in a desperate struggle to keep pace with inflation. Now? We’ve just finished the latest gap down in a 30-year, secular downtrend of wage and salary disinflation (i.e., lower and lower inflation). So far, the inflation crowd has been waiting for Godot. 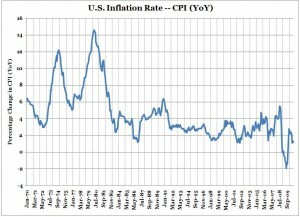 Maybe someday the Fed will spur some inflation. But there’s no clear evidence of that yet. And until then, we’re sticking to our story. Real estate in Miami and Coral Gables generally remains overpriced relative to the fundamentals: incomes, rents, historical values, and (in the upper price ranges) months’ supply. Buyers have time on their side. In other words, we agree with the Kyle Bass who sees real estate prices flat to down for several more years before a new phase of rising prices, not the Kyle Bass who sees hyperinflation. Kyle Bass was one of the hedge fund managers who correctly predicted — and mightily profited from — the housing bust. He’s now predicting hyperinflation as a result of the Federal Reserve’s wild creation of new money (that “quantitative easing” stuff you heard about on the news lately). The challenge for investors is where to put your money if we as a nation are losing control of our monetary base and monetary policy, which he believes is starting to happen. We have a monetary base of $2 trillion and the Fed is talking about printing another $1 trillion. The Fed is experimenting and they admit they do not know what they’re doing. On the subject of real estate, Bass cites data from 28 housing busts in developed countries since 1970, and estimates that we’re about three years away from a housing recovery. Peak to trough, the decline in median prices has taken about six years on average, with the bulk of the decline occurring in the first four years. If the housing bust started in late 2006, we’re mostly done with the price declines in the moderate price range. But there’s so much inventory that, even if prices don’t go down much more, they’re not going to go up for about three years, because there will be continual supply as yesteryear’s failed buyers get washed out. In real estate markets like Miami and Coral Gables, where it still costs much more to own than to rent, Bass’s timeline would suggest there’s no urgency to hop from renting back to owning. Bass sees a more troubled picture for the high end, where he thinks prices are still coming down. Prices could thus continue falling for luxury real estate in Miami and Coral Gables. That’s pretty much the opinion that’s been offered here time and again (and again and again and again and again and again and again). Glad to be in such good company.